Kath and I are settled in our lovely Gosforth flat after a brilliant first week working in Gosforth Central and Gosforth Junior High middle schools. 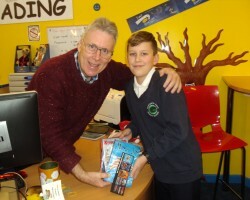 We also managed to fit in a return visit to our fans at Seaton Sluice Middle School and we’re still reeling from one of the biggest subsequent book-signing sessions ever! Such was the response to our books at all three schools, we had to get in touch with our publishers to request more books for next week’s presentations! However…no one’s complaining; the more fans we have devouring our spooky stories, the happier we are! Whilst having a great time visiting the schools, we also made time to enjoy the area. Over the last few years we’ve stumbled on some great places to relax, enjoy a coffee and stroll around taking in the scenery. 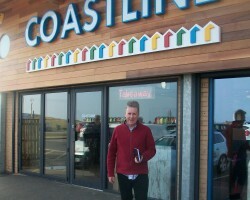 After visiting Seaton Sluice MS we headed straight over to the Coastline café just beside the Blyth Port. We also took some time out to drive over to Tynemouth and sample the best fish and chips in the world at Marshalls – straight out of the sea and into the pan as the locals say! Thursday. Thereonafter I spent most of the time signing countless books for a host of fans, new and old. Big thanks to Sue Lamberth, Nikki Johnson and Keith Bell for hosting us so well in the usual warm NE fashi0n. 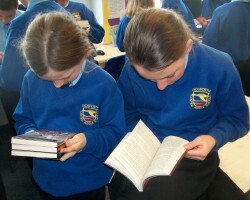 It’s so humbling to find how many pupils love our books and send us so many fab e-mails. A special ‘thank you’ to Adam from GEMS for being such a big fan. Adam almost had to use a wheelbarrow to bring in his books for me to sign! 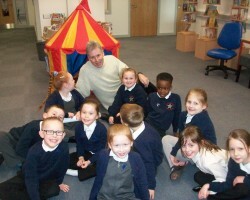 The week could not have started better, with two wonderful days at the Wainwright Academy near Mansfield and Staveley Junior School in Chesterfield. 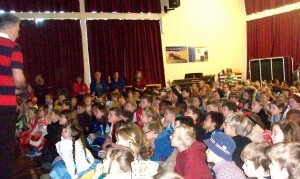 Both schools seemed filled with devoted fans of our books, despite the fact that we only visited Wainwright Academy a short while ago for the first time, and Staveley Juniors around eight years ago towards the start of my author career. This is what keeps Kath and I going – the fact that the children never forget us and want to be on board with us and our spooky books forever! 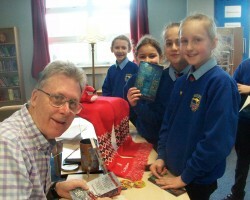 We carried out an afternoon workshop at both schools and the children were fantastic…some real talent out there with these ‘wannabee’ authors! ‘Keep up the good work y’all,’ as they say in Louisiana! WORLD BOOK DAY finally arrived and we had the most amazing day, hosted by St Bede’s RC Primary in my home town of Rotherham. 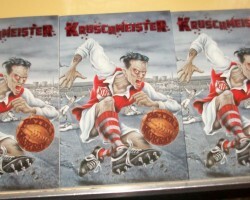 Quite fitting as this school was my Dad’s old school and close to the old Millmoor football stadium where my new KRUSCHMEISTER book is set. It was a real thrill to present the book to so many Rotherham children and staff – all familiar with the setting for the spooky tale and now all itching to find out what happens to the poor little victim in the story and to learn the fate of the awful ‘Kruschmeister’ character! I’m not going to write any more! Let the pictures speak for themselves! 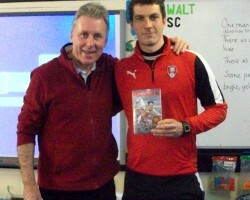 But a MASSIVE ‘thank you’ to all of the headteachers and staff involved and to Rotherham United and everyone else who has supported this book from the outset. I can see huge success for this book in the days, months and years ahead and I could not possibly have written it and got it off to such a great start without all of your help! 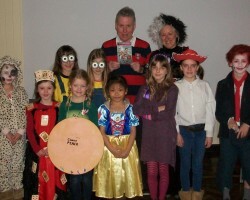 Oh, and by the way, Kath and I thought the outfits for World Book Day characters, were amazing. Everyone involved seemed to make a big effort. It was humbling to see so many of our own book character among the crowd. Thank you to parents for taking so much trouble with their young book fans.